This statement says everything to know about this Celtic/Viking warrior woman. Being of “Viking” decent, I watched a “Discovery Channel” program on the impact the Vikings had on early Europe. 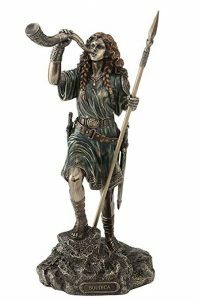 Boudica was a Celtic Queen of the Icenti Tribe of the east central coast of England during Roman occupation, around 60 A.D. She is considered a British folk hero. If only the Roman’s hadn’t been so brutal! It was because “Roman’s behaving badly” that Boudica was able to bring previously warring tribes to a united front. 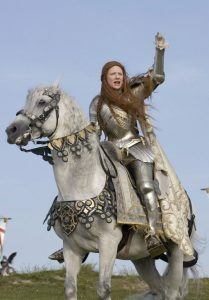 Through her bravery, she raised an army and inflicted the same humiliations upon Roman settlements. Although tragic in its final hours, her legacy gave future generations a heroine to look to for inspirations of fighting the good fight against tyrannical rulers. All of this was first related by Tacitus in the Annals. Tacitus’ father-in-law had been the Roman’s governor of Britain and had witnessed the blend of savagery and heroism that seemed to characterize the people there. 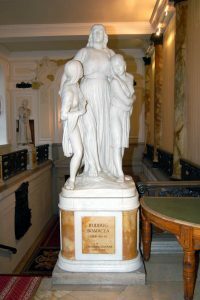 But like much classical learning, the story of Boudica and the (attempted) colonization of Britain was largely lost until the Renaissance, when Tacitus’ histories were rediscovered and republished in new editions across Europe. The rediscovery of Tacitus, whose works began to trickle into Britain during the reign of the Tudor monarchs, caused a stir in the still-fractious nations of Britain: heroic myths, including the fantastic tales of wizards and courtly knights popularized by Geoffrey of Monmouth, were swept aside. 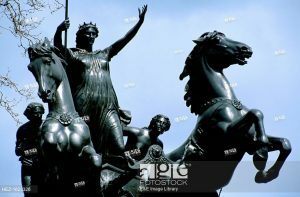 In their place stood a woman, described in William Cowper’s 1782 poem ‘Boadicea an Ode’, as ‘bleeding from the Roman rods’, with vengeance in her eyes and a spear in her hand. 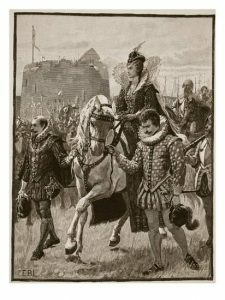 Speaking of the Tutor’s, the 1st Queen Elizabeth took a page out of the legend when she took up battle armor to lead her army against the Spanish Armada off the coast of England. Her presence on the front was the catalyst to make sure her army would hold off the assault. As it turned out, the weather and poor planning by the adversaries, was on the side of the Brits. The next two Spanish campaigns also suffered from poor weather. 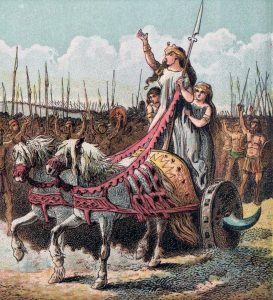 Since the Victorian age, Boudica’s history has remained strong, both personal and political, after two millennia. No wonder she has been immortalized. And no wonder, when still, women are marginalized.